Where to begin? 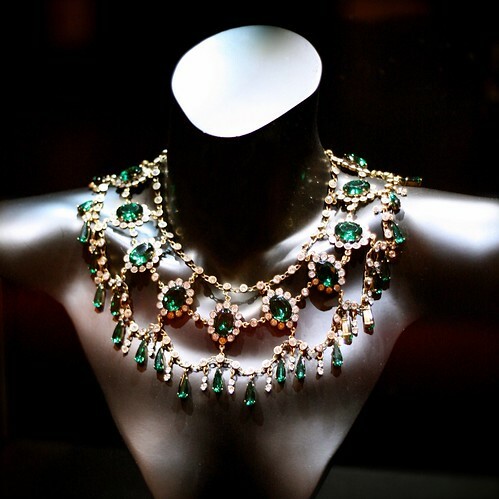 Here at the Liceu , a stunning exhibition is on display of many of Maria Callas' jewels from the great, historic roles and productions in which she starred. Actually, perhaps more accurately, in which she changed the face of opera. One glittering creation outdoes the next, but the photos that accompany the displays call to mind the reality that it was, in truth, not about the jewels at all - in fact, these stunning jewels somehow fade into the background when asked to compete against the intensity and fire raging in her eyes and the unbridled yet always studied passion of her voice. Ironically in seeing these astonishing pieces in person, it's all the more clear HOW potent "La Divina" must have been to surpass such stiff competition! There can be no mistaking the fact that she did change the course of opera through her fierce attention to details scribbled by the composers she revered, to her complete absorption of the characters she created, and by the way she redefined the definition of a true diva (a term sadly hijacked today by all too many wanna-be's.) I can't begin to imagine the torment that was her life - and now it feels impossible to separate her tragic life from the lines she sings which we listen to decades later, but this exhibit calls to mind the impact her artistry and her life had on so many numerous people. For these and so many other reasons, I am grateful for Maria Callas. Hi! It's the girl you met yesterday after Cenerentola. I just wanted to thank you (again) for being so nice. Juan Diego was not even half as sweet as you. Nope. I completely agree with you on what you say about Maria Callas. I read her biography last year and she had such a miserable life, poor her. But then, she sang, and made everybody else's life a bit better. Keep being 'cramazing' ;) I look forward to the next time I can hear you sing!